I was seriously thinking whether or not to share this. But I did want to journal it on my blog so here goes. 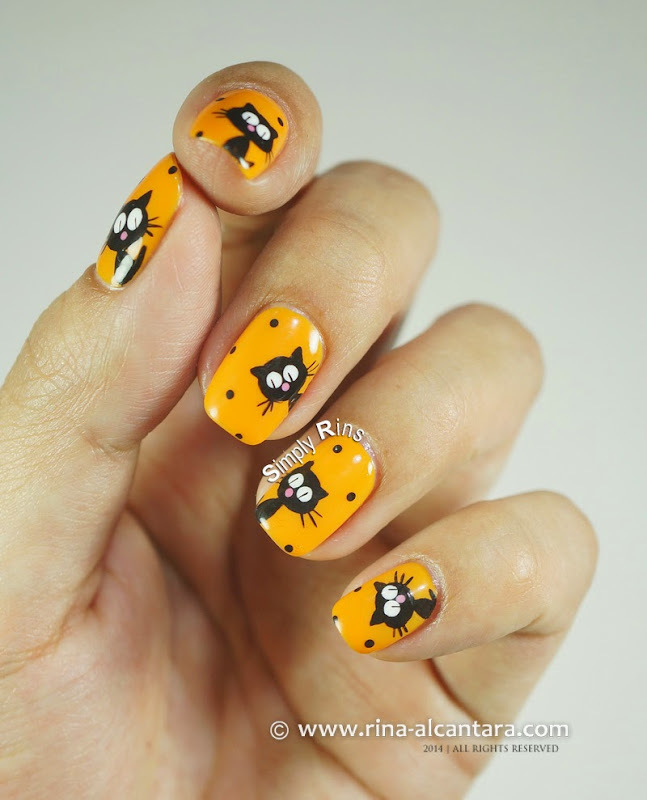 My Halloween nail art designs were featured on Gandang Ricky Reyes (Todo Na To) television show at GMA News TV last November 01, 2014, Saturday at 9:00am. Before, I would get excited and invite you, my readers, to watch out for the show. But I only told a handful of people I know. Based on my experiences with TV features from this network, I learned not to expect much. I know that this may sound off to some because I should be thankful that they invited me to be part of their Halloween episode. I am thankful and sort of disappointed at the same time. More on that later. On the show, I was given a short segment to feature Halloween nail art designs. Beforehand, I was interviewed about my art and a video shoot of me painting my nails. At the time, I was wearing the Return of the Black Cats Galore and intentionally did not paint a nail for the shoot. Everything went smoothly except that I was shaking a little while painting. I always get nervous when someone else is recording me as I paint my nails. Please forgive the lousy video recording. I took it straight from the tube using a tripod. I was promised a copy but it never materialized. I also wasn't able to record from the very beginning because it all happened really fast without even a teaser. It didn't have proper credits as well. I was never introduced. There was no byline as I was speaking. Hopefully viewers were able to guess who I was through the pictures that was shown that had my watermark. I would have provided high resolution photos of my work if I was asked so that they could be displayed on screen at a scale that people can actually recognize the nail art and have time to appreciate it. So sorry for all the rants. You see, I was fully prepared the day they came by the house. I just wished they did more research, gathered more worthy photos, and added proper credits. I always get giddy when there's an invitation to be featured on national television or newspaper because it's another chance for people to look at nail art in a different perspective, at least here in the Philippines. I pray that one of these days, there'll be a thorough feature on this craft. Regardless of how I felt, I'd like to thank GMA News TV and the show for letting me be part of their Halloween episode. How exciting! I'm glad you got a chance to share with a big audience even though it didn't work out quite as you'd hoped. I hope the people who filmed you read your blog notes with an aim towards learning how to better present nail art features. There are SO many of us out here now that a company/channel/organization/network/whatever can be really boosted in their ratings and profitability by learning how to cater to what we look for: detailed pictures with high resolution, time for explanations of the technique, appropriate credit, and even some time given for people to call in with questions. They'll learn. And you did a great job! I appreciate that you understand where I am coming from. I'll be keeping my fingers crossed.